This year, I moved from my position as a fifth/sixth grade science teacher at a small private school to a ninth grade Earth Space Science position at a local, urban high school. As I was getting ready for the new year in this new school, I did a lot of revamping to my classroom management techniques and decorations. In light of that, I’ve created a number of new mini-posters, printables, and organizational signs. Many of these were inspired by THE Classroom Management Book by Harry K. Wong et. al. He is the writer of The First Days of School, as well, which is also a great read! 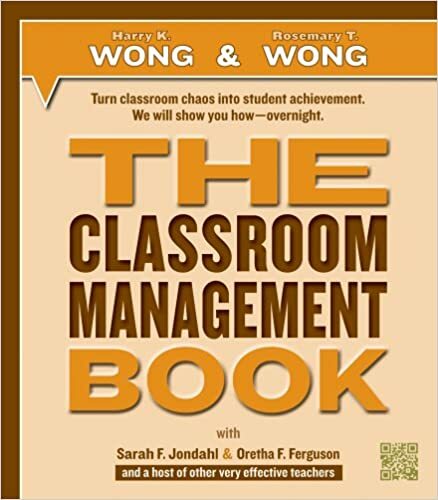 The primary difference between the two books, as I see it, is that THE Classroom Management Book’s focus is on implementing the procedures touched on in The First Days of School. It has a lot of really great examples from real classrooms and provides specific strategies to teach and implement pretty much every procedure you could possibly need. Sooo many great ideas, and I highly recommend it! It seriously made my transition this year SO MUCH EASIER! Great read for both new and veteran teachers! 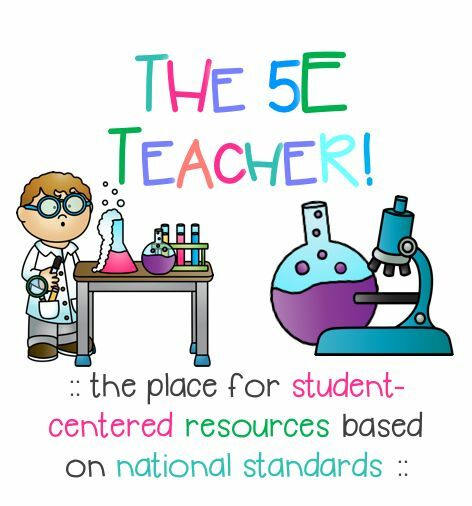 You can click on the image to visit my TeachersPayTeachers store, where you can download the PDF file for free! 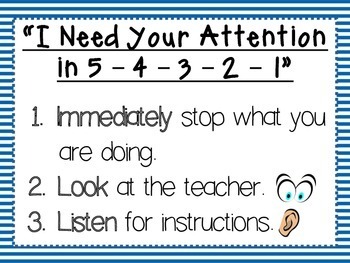 I also created a way for students to get my attention – again inspired by THE Classroom Management Book. Instead of students interrupting class by announcing their needs, simple hand gestures can indicate student requests. I have created the Finger Cues posters below. 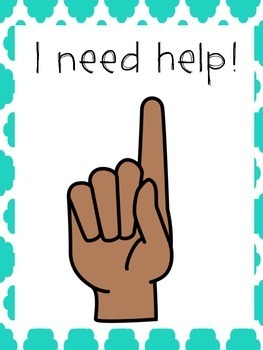 I simplified the ones suggested in the book to just three — one finger means “Help!” Two fingers means “Bathroom?” and a pencil held in the air means they need to exchange pencils or use the sharpener. You can download these at my TeachersPayTeachers store for free as well! I wasn’t sure how the high schoolers would take this, but the majority have actually gone with it, and it has made some interruptions easier — such as pencil-sharpening during notes and bathroom requests during direct instruction (although they SHOULD know that my answer at that time is always “not yet,” sometimes they still ask). 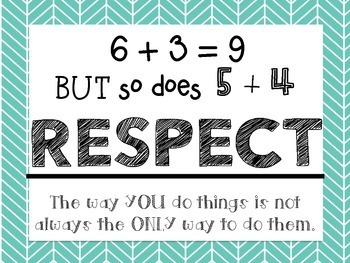 When students choose not to follow the above procedures, there are obviously going to be consequences. As recommended in the book, I have set a clear order of consequences. While I have included this list in my syllabus, and we will discuss it early in the year, I have also decided to post it in my classroom in order to refer students to the list when necessary. 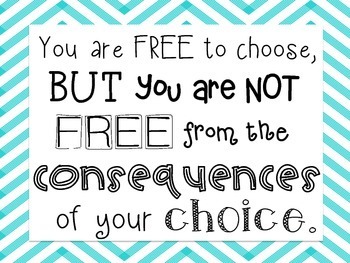 Below, you can find the link to download the free printable at my TeachersPayTeachers store. As you can see, my Level 2 intervention is an “Infraction Slip.” This has been very effective at documenting student behavior and enforcing a consequence within my classroom. 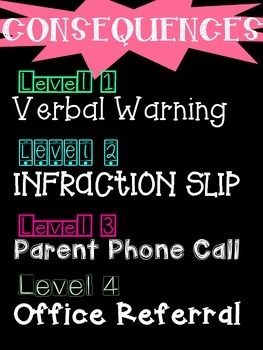 Unless behaviors escalate or infraction slips accumulate, they simply stay in my files. They do not go to parents or administrators. In a way, they are just a tangible warning. After I’ve given an official verbal warning, this is the next step. My impressions so far is that it seems to help with redirecting negative behaviors. I generally write it out and deliver it to the student privately. I try to choose my timing carefully — if it seems like the student is very volatile and it would only worsen the situation, I generally wait until they have calmed down to talk to them about it. If however I feel it would be helpful to address the behavior immediately, I take the time to do that. I also try to document if behavior improved afterward, and I make sure to show students that I also recorded that. I want them to know that these things are not set in stone, and while I will call out their poor choices, I also recognize when they are making good decisions. The other day, I had problems with a student who would just not stop talking. He was yakking the entire class – during instruction, during independent work, etc. I filled out the infraction slip, reminded him again that this is just a classroom document and the NEXT step would be a parent phone call, and asked him to sign it. I tell them that if they choose not to, that’s fine too – I will just document they refused to sign it. He decided to read what I had written, and as he was reading, he was nodding, “Yah, that’s true. Yah, I did that.” He then wrote, “The student will… stop talking and do work.” And that was the end of it. He signed it, and the last twenty-five minutes of class, he did a pretty decent job keeping his chatter under control. The thing is – it only works if you use it. I was having a similar problem in another class with two students, and for whatever reason, it did not occur to me to pull out the infraction slips. Instead, it felt like I battled with them all class, trying to keep them on-task. Next class, if the same problems arise, I intend to give them the official verbal warning immediately and then go right to the infraction slip. Hopefully it will have the same effect as it did with the young man I discussed above! 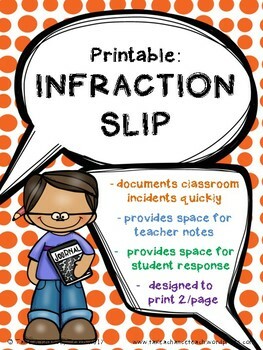 Anyway, you can also download my Infraction Slip at my TeachersPayTeachers store for free! I have also created a few posters with quotes that have a good message. These are available for $1.00 at my TeachersPayTeachers store. You can click on the images to take you there!